This is a first record for Borneo and Malaysia. Its nearest geographic range puts it in Vietnam and the Phillippines. Early yesterday morning, after 2 days of searching in the coastal scrub habitat of the northern tip of Borneo, local name Simpang Mengayau, Andy Boyce and I finally heard the distinctive song of the Manchurian Bush Warbler Cettia canturians. Two mornings earlier this bird was first spotted by local birder Zaim Hazim who was basically doing the same thing as we were, trying to spot migrants which might use this area as the staging ground for their return migration up north. Not sure of what this new warbler was, Zaim made a voice recording on his mobile phone and posted it online. Incredibly lucky for us in the birding world, bird trip leader James Eaton had a listen in this clearly not the best recording and picked out the song of the bird. 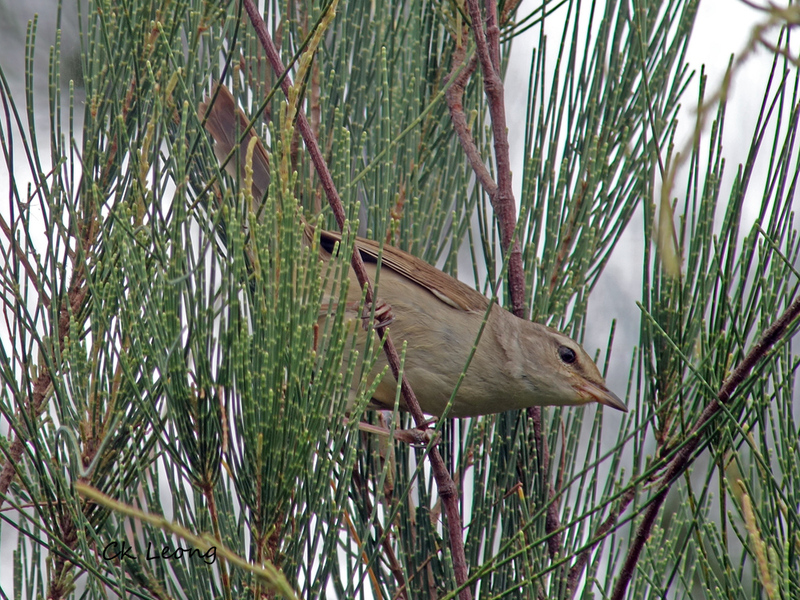 The bird was a first for me and I had not expected a bush warbler to be high up in the pine needles of the casuarina tree. But it was there, and vocalizing constantly. 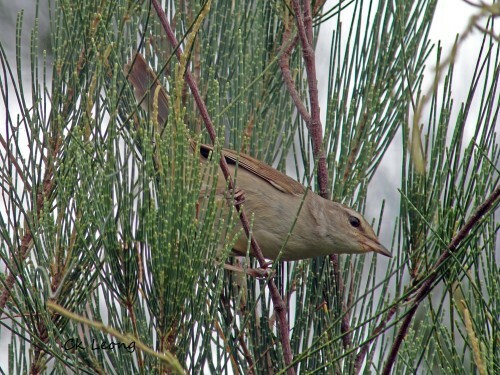 It took me a long time to get a decent enough photo of the bird which was moving in and out of the leaves around the top of the tree (digiscoping is really not the way to go for such birds). But it was there a long time, feeding (insects I assume) and singing. What a beautiful song! What a great day!